Trackball is a pointing device. It consists of a ball, which is held by a socket containing sensors to detect the rotation of ball around two axes. Nowadays, miniature trackball is incorporated in the mobile phone for navigation. 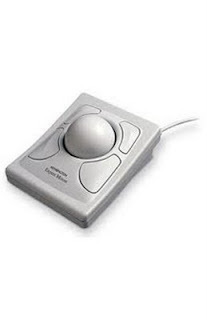 Users can roll the ball with thumb or finger to move a cursor. It allows fast scrolling in any direction.